Here's an idea I adapted slightly from something we did at playgroup a couple of weeks ago. 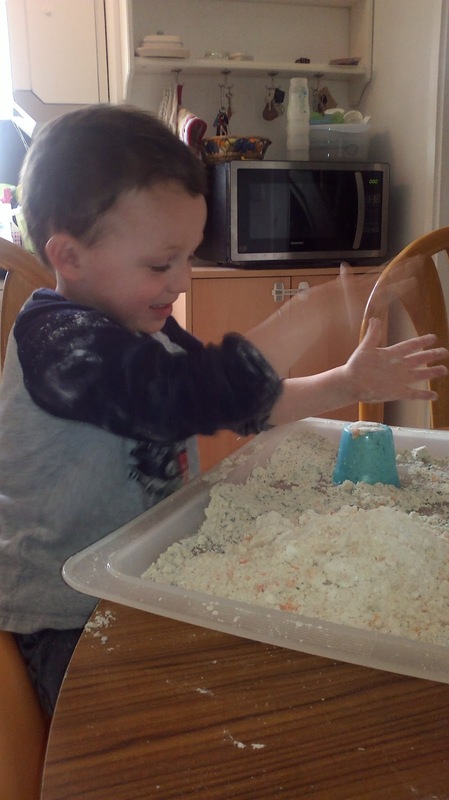 You can make a 'sand' for pressing into 'sandcastles' and other creative play from flour. 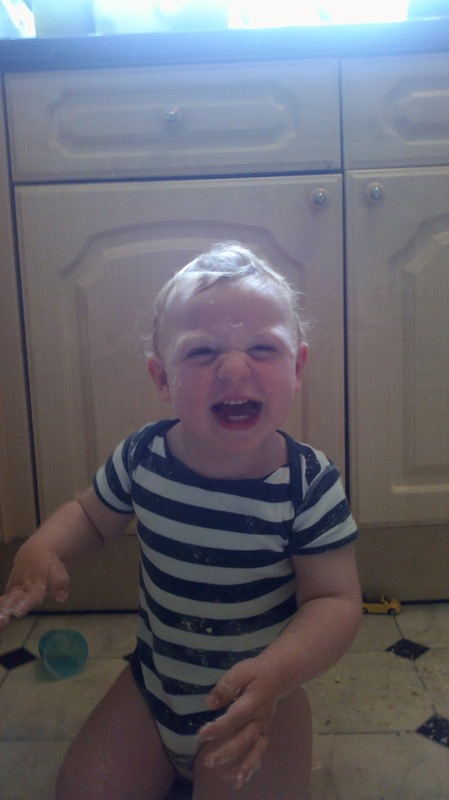 At playgroup they mixed plain flour with a little baby oil to form the consistency of apple-crumble topping, but since the chances of Toby eating it were pretty high I exchanged the baby oil for regular vegetable cooking oil. Playgroup also suggested colouring the sand with powder paints, but again I switched this for food colouring. For wheat-allergic kids I see no reason why you couldn't substitute the flour for cornflour or other non-allergic flour. added in some extra spoons, cars and pots. Again, it all started off quite sedate and with lots of building and squishing. Very quickly, however, Toby realised that throwing the moon sand up in the air made Ollie laugh. Ollie wanted to make Toby laugh in return, but since he's bigger and stronger, rather than dropping down neatly back on to the tray, suddenly the moon sand was flying everywhere, which made both of them laugh uproariously. It wasn't long before Ollie took to loading the tray back up with moon sand and tipping it over his own head, which little brother tried valiantly to copy. In the tradition of small boys everywhere, they never laugh as much as when they think they're being naughty and causing a right royal mess! The saving grace of this activity is that it does clean up pretty easily with a dustpan, although the oil content means that caution needs to be exercised as the floor (and the children) can become a bit slippery. I wouldn't recommend this at all if you have carpets you care about. I also barricaded across the door to try and prevent small flour covered boys charging into the rest of the house and coating everywhere. My barricade failed and I'm again grateful for the amazing vacuum cleaner my parents sent to me last year, and to the fact that my cushions can go in the washing machine.